If you're a math and pie fan, March 14th aka 3.14 is a banner day. Last year in honor of Pi Day I created a π themed pie playing off of the equation for area. With a raspberry and rhubarb pie; get it r-squared? (Insert, hearty chortle...ok, maybe insert polite laugh). This year I decided to go for a more playful route and make Pop Pi(es). Hooray for pi! 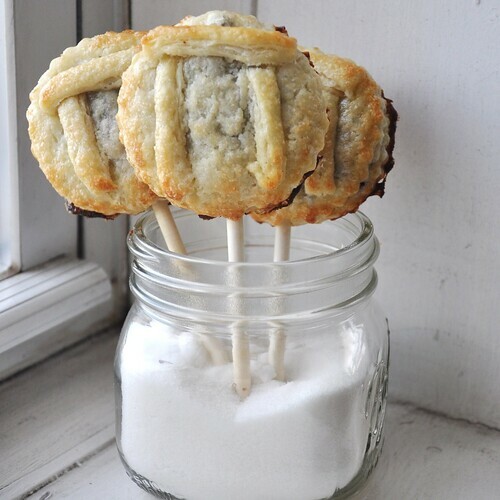 Hooray for pies on sticks! I've entered these lovelies in the the Serious Eats and Instructables Pi Day Challenge. You can check out my instructions for making Pop Pies over here. The contest is open for entries through 3/20, then it's voting time. I'll be posting a voting reminder next week when the polls open. In the meantime, Happy Pi Day!